John M. Newman is an expert on competition and innovation policy in technology markets. He began his legal career with the U.S. Department of Justice Antitrust Division, where he helped investigate and litigate abusive practices by large firms in a variety of industries. John has also advised multiple start-ups pro bono on a variety of contract and intellectual property matters. At the University of Memphis, John teaches antitrust and contract law. 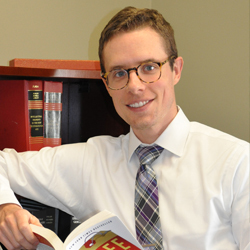 His scholarship has been published in leading academic journals, including the University of Pennsylvania Law Review and the Vanderbilt Law Review. His commentary has been featured by CNBC, Business Insider, and Bloomberg, and he has delivered lectures at universities ranging from New York to Shenzhen. John has received the law school’s Faculty Scholarship Award and is the youngest faculty member in the school’s history to have been selected as Professor of the Year. In his spare time, John enjoys cooking, modern art, renovating his downtown condo, and skateboarding.